For a while, Cleveland’s ace was one of the team’s sure-things. Players could go cold at the plate, relievers could get the yips, the club in general could hit a slump. Despite all of this, when Kluber was on the mound, fans could often expect great results. Unfortunately, this isn’t the lasting memory we have of him as Cleveland enters a make-or-break season. Instead, our last look at Kluber was a dreadful postseason showing, which followed yet another October to forget in 2017. 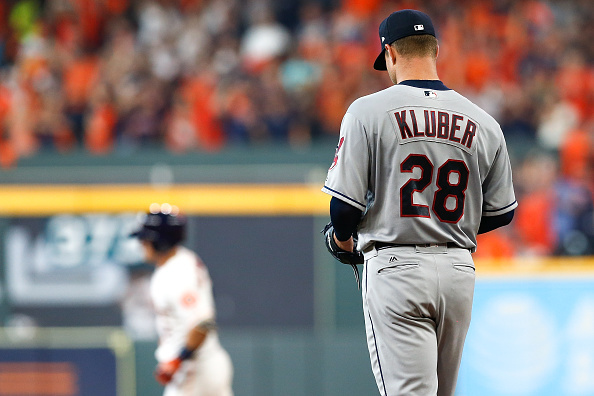 Instead of quieting the Houston Astros‘ bats in last year’s ALDS, Kluber was wrecked to the tune of six hits, four earned runs and three home runs in just 4.2 innings. He very clearly didn’t look himself, appearing completely gassed by the time he was mercifully pulled. Suddenly, Kluber no longer carried his trademark mystique as one of the game’s elite starters. That this followed the 2017 postseason, where he gave up a combined nine earned runs in 6.2 innings against the New York Yankees, just made things worse. Due to these rough postseason showings, fans are no longer seeing Kluber as untouchable. Instead, they’re wondering if he’s beginning to decline. This is why Kluber is facing far more pressure than any other Indian this season. Still seen as the team’s top pitcher, he has to prove he’s not losing his touch. It may seem a bit overblown to look at three postseason outings and claim Kluber might be trending downwards. To be fair, though, part of the concern comes from how a dip in his performance could impact the team as a whole. Despite Trevor Bauer‘s stellar 2018 season and potential breakout years ahead for Mike Clevinger and Shane Bieber, Kluber is still the leader of the rotation. Should he start consistently showing signs of trouble, it could throw the clubhouse off. Simply put, there’s a different atmosphere when Kluber has a rough showing, as if the team is so used to seeing him excel it doesn’t know how to handle it when he doesn’t. Further complicating the increased pressure Kluber is facing is how he handles any ailments he endures throughout the year. The past two seasons have ended with speculation Kluber was pitching hurt, despite the fact he claims otherwise. The Indians swore up and down he was fine last year, right up until the day they announced he needed an injection in his knee. As a result, there’s reason to worry about Kluber pushing through any bumps and bruises he endures in attempt to show he’s fine. Not only would a decline impact the Indians’ chances on the field, it would also hurt their ability to move him if this was still being discussed. Ken Rosenthal noted Cleveland was still shopping Kluber, though the asking price was understandably high. The second it looks as though he’s lost a step or two, the Indians would no longer be able to demand instant help, therefore setting themselves up as losers in any potential deal. While I doubt Kluber is concerned about increasing his appeal for other clubs, he’s undoubtedly still heading into the new year aiming to prove he’s just as good as ever. The pressure to do so, though, is unlike anything any other player in the clubhouse is facing. The Indians are touting their rotation as one of the main reasons why there’s no reason to worry about their winter of shedding salary. As long as the starters are intact, the team should still contend for a playoff berth. If Kluber carries his postseason struggles into the new year, though, it could put those plans in a bind.